My last post was about the terrible fires we were having in our area. As the holidays rolled around, we thought that we were past the worst of it. And then came the predictions of a bad rainstorm, and the serious worry about mudslides in the burned areas. We again had mandatory and voluntary evacuations in the potentially affected zones. But it wound up being far worse than anyone could have imagined! During the early morning hours of January 9th, tragedy happened. In our neighboring community of Montecito, torrential rains came down, and with it, came an unbelievable amount of mud and huge boulders tearing down. The mudslides swept away anything in their path! When daylight came, the local news coverage showed complete devastation over a very large area. The picture with this post was taken from our backyard, by my husband. 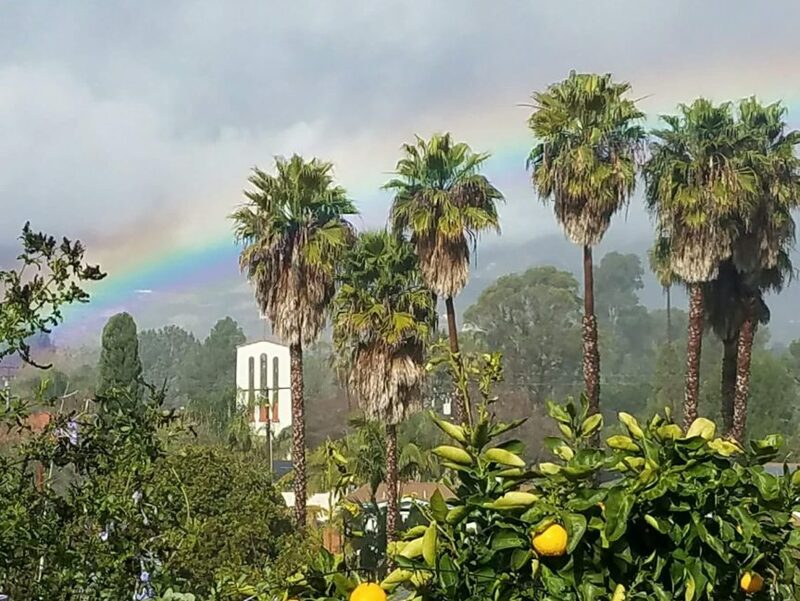 The same morning that we saw so much destruction and human suffering on our television, this is what we saw when we looked out our kitchen window. How could it look so peaceful to us, when just a few miles away such unimaginable horror had happened? I kept thinking how incongruent it all was. It felt surreal! It still does. I have just a little bit better understanding of what survivor’s guilt must feel like. My life is still intact, while so many people nearby are reeling with grief and loss. How does it all make sense? It doesn’t. There’s no rational explanation for what’s happened. All we can do is to begin dealing with what is. People have died, loved ones have been lost, homes have been destroyed or badly damaged, so many have had their livelihoods interrupted, and on and on. Most of Montecito is now under mandatory evacuation, so that clean-up can take place. Nothing is as it should be for those directly impacted, and won’t be for a long time. Again, the “helpers” have been amazing! Various types of professionals have been giving their all to cope with this tragedy. They’ve rescued the living, recovered the dead, connected the survivors with needed services and resources, kept law and order, shared necessary information, and are now coping with the horrendous clean-up task that must happen before people can resume any type of normalcy. If none of this is in “your backyard,” count your blessings! But if you do live somewhere in the area, reach out to each other. If you need help, please ask for it. Let someone know that you’re struggling. If you have something to share, whether it’s time, money, expertise, energy, or a heart full of love and compassion, there’s a need for all of it. Let each other know that you’re here, that you want to connect. With increased connection, comes increased strength! Be there for each other. If I can help, please let me know. I care, and I want to make a difference. We will get through this. Let the image of this rainbow bring you comfort. Better days will come! ← Be Sure You Make Time to Play! Very nicely worded. We are indeed feeling all of what you mentioned. Start hugging each other, thanking each other and allowing each other to grieve through the compassion you can give…it’s simple and it’s free. Thank you, Maria! I’m glad that you found value in what I wrote. I agree with you, it can be simple and free to connect with others. Sometimes we might have to stretch a bit out of our comfort zone, though. But it’s so worth it! Even if we’re shy or reserved, we can learn to reach out.